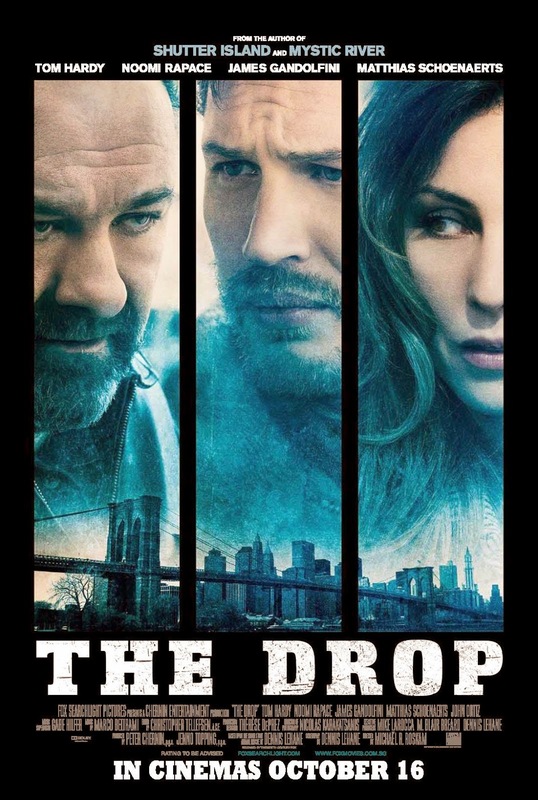 Tom Hardy’s performance certainly got the drop on me. He proves yet again why he is one of the most versatile actors going. So what’s it all about? Bob Saginowski (Hardy) finds himself at the centre of a robbery gone awry and entwined in an investigation that digs deep into the neighbourhood’s past where friends, families, and foes all work together to make a living. No matter the cost. Penned and adapted from a short by Dennis Lehane, I knew I was in for a treat. Lehane has been responsible for some of the better crime dramas and thrillers of the last few years; Gone Baby Gone, Mystic River and Shutter Island. It was also a fantastic and fitting endnote for the career of another talented actor who left us too soon. I’m looking at you, Big T. Mr Soprano himself, James Gandolfini. BUT despite the fantastic casting, the pace leaves a little to be desired and the story? Considering the hype about killer twists. I found it all a little too simple and predictable. Lehane’s work us very much in touch with my favourite genre, the film noir. The characters and seedy underworld were certainly captured perfectly by director Michael R. Roskam. Complimented by the grainy cinematography of Nicolas Karakatsanis. BUT the convoluted, multi-layered story line? Not so much. It did leave me wanting a little afterwards. All that promise and a twist that I saw coming a mile off. A shame. BUT that’s not to say it isn’t worth checking out. Hardy is a charismatic lead, who has great chemistry with the equally talented Noomi Rapace (The Girl With the Dragon Tattoo). Rapace played the anxious and hesitant Nadia perfectly. Her role and motive questionable throughout. The pair worked well together and I didn’t mind following them as their relationship inevitably blossomed. Their bonding was helped by the discovery of an abused puppy that Bob finds in a trash can. Rocco the puppy was adorable (What? He was. Losing man points like crazy). It lightened up the dark, gritty undertones bubbling beneath the surface which killed the atmosphere a little bit. BUT if the little pup didn’t appear, there wasn’t much else going on to begin with. It also allowed for Bob to break his shy demeanour and pry into his background a little. Oh! James Gandolfini was superb. To be honest, there wasn’t enough of him. I couldn’t help but feel that his character Cousin Marv was nothing more than a “What If . . . Tony Soprano went in Witness Protection and became a bar owner”. His presence and delivery stole every frame. No, not like that. His one liners just made me want to go back and watch The Sopranos all over again. Marv’s fractious relationship with Bob was an interesting one to watch. The tension slowly building as tempers rose. The pressure mounting from their business interests under the vague title of “The Armenian Mob”. However, as the mayhem ensued, I felt Gandolfini’s character took a back seat. Understandably to an extent, without spoiling any content BUT still a little disappointing. Matthias Schoenaerts (Bullhead) was also fantastic. A nasty piece of work. Chewing up every bit of suspense. A ticking time bomb. His predatory stalking was a masterclass in suspense. First toying with Bob by asking for an umbrella and gradually making his presence known more and more. The kitchen scene with Rapace was nail biting stuff. Morgan Spector and Michael Aronov played the roles of the Armenians quite well. BUT at the same time, despite putting pressure on our sparring bartenders, I felt they were a little wooden and by the end, nothing more than stereotypical foreign mafia guys. Shame. The closing 20 minutes HOWEVER were tense, suspenseful and brilliant. Double crossing and backstabbing galore. I just wish there was more of this throughout. I won’t divulge too much information but perceptions are changed. The slow burning tension did meander and sizzle a little too much for the 106 minute running time. I felt John Ortiz’s (Silver Linings Playbook) role was completely unnecessary. Nothing more than a suspense catalyst. And a poor one at that. Re-appearing when the film seemed to lull or asking rather mundane questions after a nasty bit of business had gone down. Even his covert dark alleyway rendezvouses with fellow officers led nowhere. Merely relaying information we already knew from Big T but with a much flatter and duller delivery. I kept hoping his character would go somewhere (Preferably out of this movie). BUT nope! Not even the final exchanges in the closing minutes were revelatory or needed. Weak. Suspenseful, tense and brutal (in parts) but also a little predictable and long at the tooth. However, Hardy has certainly established himself in the big leagues and with performances like these, he will continue to do so. And farewell Big T. One final – CUT TO BLACK.